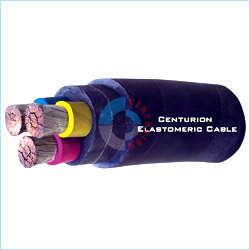 Owing to our vast experience in this field, we are able to manufacture and supply high quality Trailing Rubber Cables. Made using top quality annealed copper and elastomer compound, rubber cables are very durable and heat resistant. Our huge infrastructure facility is equipped with high-tech machines and technology. We manufacture these cables following modern techniques to obtain the right quality cables. The Trailing Cable is mainly used for trailing, festooning, mobile machines and Eot Cranes, Stacker Reclaimer, Winding & Rewinding Purpose, Hoists. Material Max. Cond. Temp. for continuous operation Deg C. Max. Cond. Temp. for short circuit Deg C. Min. Working Temp. Deg C.
Note: Full Technical detail will be provided on request through E-mail.